Thailand is my first exposure to a country with a ruling monarch. Similarly to the Queen of England, he is a figurehead and the Prime Minister is the main governing force, but looking into his history I found it fascinating. He has intervened in the mainstream policies several times and everyone absolutely adores him. 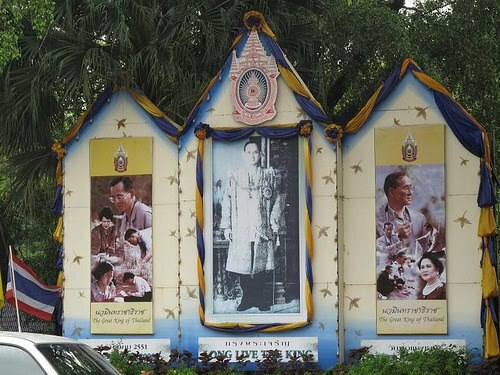 Bhumibol Adulyadej was crowned in June of 1946 and is both the longest-servning monarch in Thai history and the longest-serving monarch in the world today. Once it became clear he would be the next King, he went to Switzerland and studied law and political science in order to be a more effective leader. The first few years of his reign was during a time of military-dominated government and he was mostly secluded. In 1957, that government was ousted by a coup and the new government gave the King more visibility and clout, which also saw the King travel all around the country, attending ceremonies and visiting temples. back and forth, a military coup in 1992 caused much violence and a threat of all-out civil war. The King summoned the leaders of both the military group and the civilian group to a televised conference to find a peaceful solution to the fighting. A civilian government took place soon after and lasted awhile. more extreme people, Bhumibol went before the courts and asked for a legal intervention. New elections were held. There was more turmoil in 2006 and another crisis in 2008, but throughout all of this the King has been portrayed and appears to be as a kind man working for the People of the country. There are plaques, pictures, billboards, and shrines EVERYWHERE. All businesses seem to have a picture of him somewhere and folks are eager to talk about the King. Granted, there’s a law in place that allows people to be ARRESTED and persecuted for saying anything bad about the King, but most folks seem genuinely pleased with him. Amusingly, when I ask folks how to pronounce his name, they just smile, say it’s quite difficult, and say everyone just calls him the King. This entry was posted in Old Travelogue, Thailand. Bookmark the permalink.